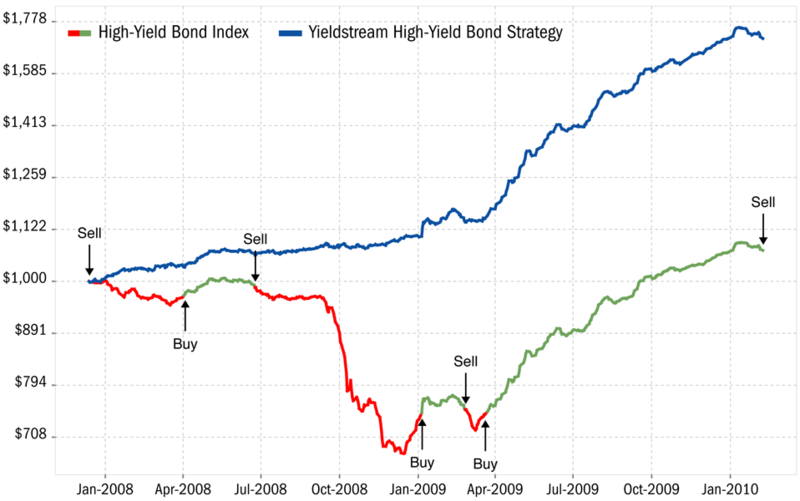 The Yieldstream investment strategy aims to identify the critical turning points in the high-yield bond market. Using a 100% systematic trend-following approach, our model portfolio is invested in high-yield bond mutual funds when the trend is up, and in money market funds when the trend is down. The chart below shows an example of what this looked like in 2008-2010, and our Performance page shows recent out-of-sample results. The result is a very steady stream of income and capital appreciation. A hypothetical account invested in the Yieldstream strategy has compounded annual gains of more than 13 percent per year, with minimal volatility and no negative years. Yieldstream is an attractive solution for investors seeking a regular income stream: most of the mutual funds in our portfolio pay dividends every month. Yieldstream is offered as a subscription to financial advisors. Updated every business day with the latest mutual fund prices, we determine the optimal bond fund allocation, and calculate the model portfolio’s current value and performance. Whenever there’s a change in the model portfolio, we send our subscribers an email alert, with details on which funds were bought or sold. If you’re a financial advisor interested in using Yieldstream on behalf of your clients, please contact us for more details. Following the global financial crisis in 2008 and 2009, interest rates and bond yields are now near historic lows. This has made it very challenging to successfully invest in bonds. High interest rate savings accounts are non-existent. Higher yields are still available in the corporate bond market. But simply buying and holding these funds would have led to a loss (drawdown) of 34% or more during 2008-2009. We believe that by using our systematic tactical investment approach, you can significantly reduce the volatility and drawdowns. In backtested returns, the Yieldstream strategy had a maximum drawdown of just 3.4%. In actual trading since 2010, the maximum strategy drawdown was -2.9%, while high-yield bond funds lost 9.9% or more (in October 2011). Please feel free to contact us at any time if you have any questions. You can also read answers to frequently asked questions, or read our research notes and insights.